Designed to crack any size nuts except hickory nuts or hard-shell walnuts, this r,heller locks and cracks them automatically. 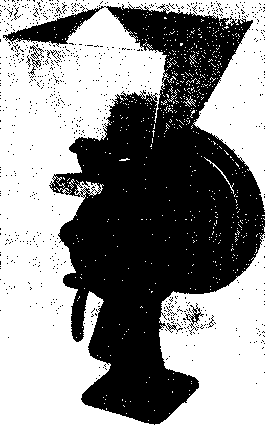 Kernels and shells fall out for rapid repeats, and the safety shield protects the operator from Hying shell particles, This electrically operated device requires 110 volts and 00 cycle alternating current, The cracker is guaranteed for 1 year, and has an estimated life of 10,000 pounds of nuts. crack any type of pecan, Brazil nut, filbert, almond, maeadamia, and English or California walnut. 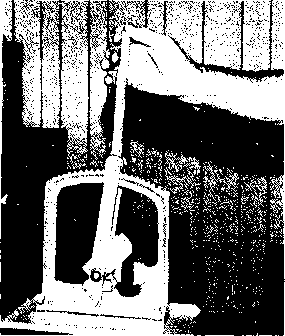 The cracker operates by placing the nut between two sockets, pulling the safety shield over the nut, pulling back the knocker stick, and releasing it. The kernel is left in the sockets, and the shell falls away from it. The tool is guaranteed for I year, and can crack up to 30 nuts in a minute. The Potter Walnut Cracker Fred Klingeiifttnith, Inc.